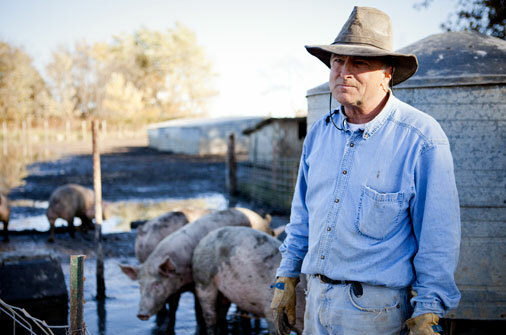 Joe Maxwell isn't your typical hog farmer (if there is such a thing). He's a fourth-generation, rooted-to-the-land, trend-bucking hog farmer and attorney who started the business of raising hogs when he was 14-years old. Back in the 1980s, the trend in hog farming was to consolidate and get big — really big. So Joe and his twin brother, Steve, chose a different route — going smaller. They did so because they loved the land, respected their animals, valued their neighbors and wanted to see their rich farming traditions carried on for a fifth generation. They believed — and continue to believe more than ever — that corporate agriculture was leaving those values behind. Their sense of right — and wrong — led them to join a cooperative of like-minded farmers who shared their commitment to take a better path. Joe practices farming the way his father and grandfather did: providing them with deep straw bedding, open spaces in which to root and rummage and no antibiotics, growth enhances or added hormones. His philosophy, he says, is to "raise hogs like you do children" and to "relearn the practices of the past." Needless to say, he's definitely relearned them well.